Edwin Evan McNeil, a retired Lieutenant Colonel in the United States Air Force and a business executive, died of pneumonia on August 23, 2002 at age 78. The son of Rear Admiral Wilfred J. McNeil, USN (Ret.) 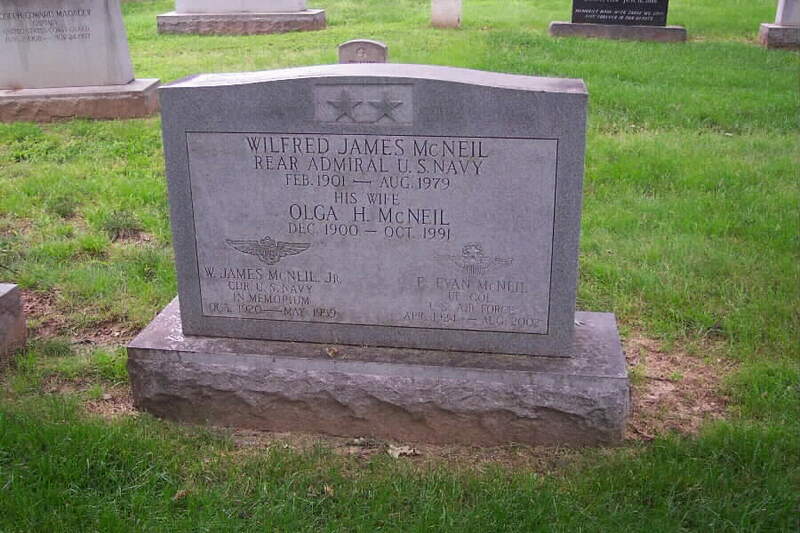 and Olga H. McNeil, Mr. McNeil joined the United States Army Air Force in 1943, serving in World War II and later commanding one of the first B-52 aircraft in the Air Force. After retiring in 1963, he became an executive with W.R. Grace & Co., New York, where he was engaged in a variety of exploration, agricultural and acquisition projects throughout the Middle East, South Pacific and United States until his retirement from business in 1983. Survivors include his wife Anne Marie; four children, two stepchildren and seven grandchildren. A memorial service will be held on Tuesday, October 15, 11 a.m. at the Ft. Myer Chapel (Old) with interment in Arlington National Cemetery. In lieu of flowers, contributions may be made to the Ronald McDonald House, 520 Sand Hill Road, Palo Alto, CA 94304.(www.ronaldhouse-stanford.org). Colonel McNeil is buried with his parents in Section 30 of Arlington National Cemetery.